Manchester City suffered their third Premier League defeat on Boxing Day following their 2-1 defeat to Leicester City at the King Power Stadium. Portugal international Bernardo Silva opened scoring for the visitors in the 14th minute after carefully putting the back at the back of Kasper Schmeichel's net. The goal was superbly assisted by Sergio Aguero who initially picked up Laporte's pass before finally putting through to the midfielder. Five minutes after, Marc Albrighton headed home a Jamie Vardy's precise cross to level up for the Foxes in the 19 minute of the meeting. And a search for both sides to claim leadership before half time proved unsuccessful as the first stanza ended 1-1. The two teams resumed hostilities after observing the compulsory 15 minutes break with the aim of outshining either side. But it was the home team that got lucky as Ricardo Pereira 81st minute strike earned them maximum points in the meeting. Pep Guardiola and his men gave their all to ensure they avoided defeat after regulation period but their efforts were not good enough as they slipped to third on the log. Meanwhile, Tottenham Hotspur rose to second position on the table following their 5-0 demolition of Bournemouth at Wembley. Son Heung-min netted twice in the 23rd and 70th minutes while a goal each from Harry Kane, Christian Eriksen and Lucas Moura sealed the win for Spurs. Mauricio Pochettino are now second on the log with 45 points after 19 league games - six points behind table toppers, Liverpool. Legit.ng earlier reported that Manchester City progressed EFL Cup semifinal after beating rivals Leicester City on Tuesday night, December 18. 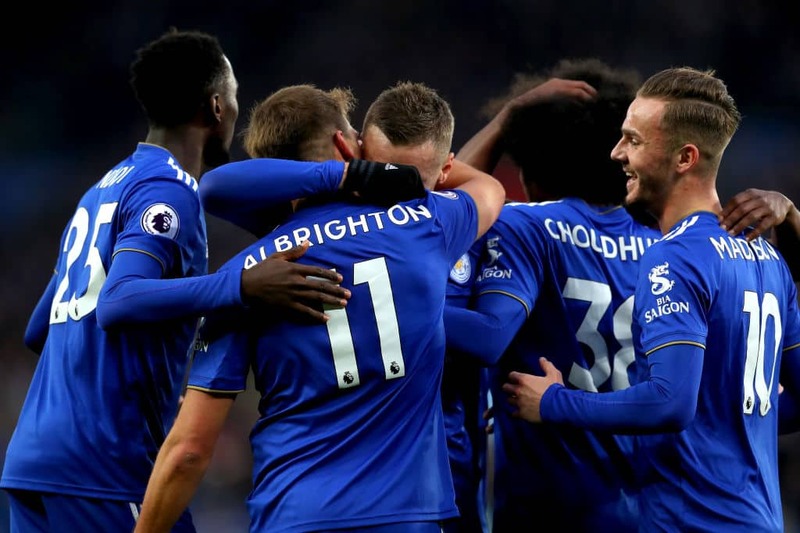 Kevin De Bruyne and Marc Albrighton scored a goal each in the regulation period before stretching the game into penalties. The Premier league however reached the last four stage of the tourney after beating their opponent 3-1 on penalties.